Michelangelo (my kel AN jel oh) was born in Italy in the village of Caprese. His father was a local magistrate. He attended school, and at the age of 12 he became an apprentice to a famous painter in Florence, Domenico Ghirlandaio (doh-MEN-e-koh geer-lan-DYE-yo). After a year or so he stopped painting and began working as a sculptor. It was during this time that he lived with the Medici (MED ee chee) family, an influential Italian family. 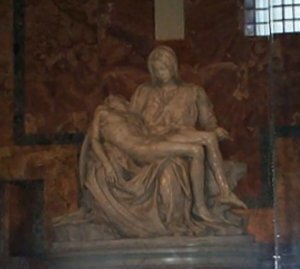 When they lost power he went to Rome, and it was there he carved the marble sculpture "Pieta"* (pea ay TAH) when he was 23 years old. The sculpture shows Mary holding the lifeless body of Jesus after He was taken down from the cross. Such a marvelous work, and only the first of many larger than life statues he would create. 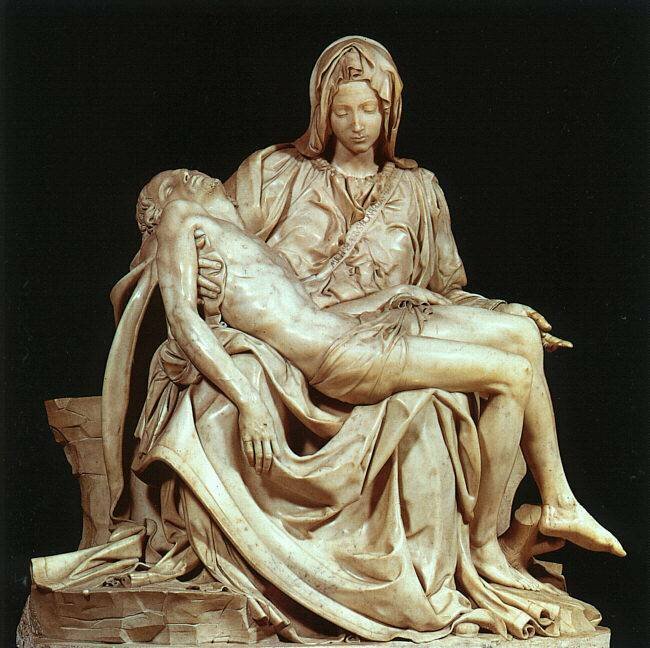 * A pieta is a painting or sculpture of Mary holding and grieving over the dead body of Christ. The word "pieta" means "pity". Many such paintings and sculptures have been done. 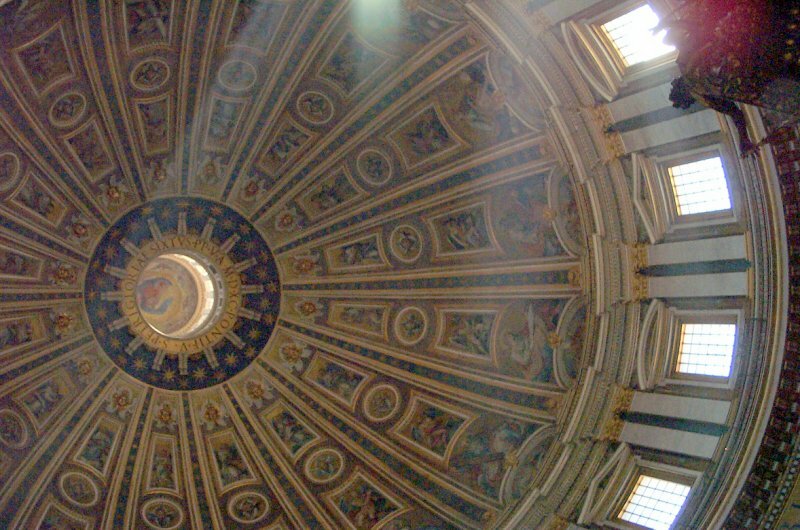 Michelangelo designed the dome of St. Peter's Basilica, but he died before it was completed. 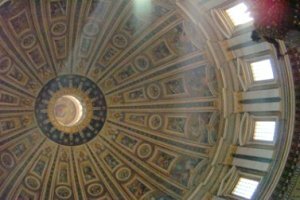 Giacomo Dalla Porta completed the dome according to Michelangelo’s drawings in 1588-89. Many artists worked on the paintings. Michelangelo considered himself first and foremost a sculptor, not a painter. His figure of David is an outstanding work. It was created around 1501 and carved from marble. David as described in the Bible was the young man who fought the giant Goliath. Michelangelo sometimes characterized his idea for a sculpture as a prisoner inside the slab of marble. He just needed to take his chisel to free the form. 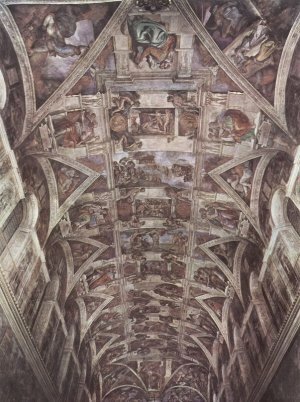 Pope Julius II wanted him to paint the ceiling of the Sistine Chapel in the Vatican at Rome and Michelangelo finally gave in to his request. This became his most famous work. It covered 1,000 square yards and showed nine scenes from the Old Testament; three each of the Creation of the world, Adam and Eve, and Noah. There were also pictures of Old Testament prophets and other figures. In the triangular panels he painted the Old Testament stories and in the crescent-shaped panels he painted the ancestors of Jesus. When painting the Sistine Chapel Michelangelo painted directly on the wet plaster which absorbed the color. He had to plan ahead and apply only the wet plaster he would be painting that day. If he made a mistake he would have to pry off the plaster after it dried and start over on that part. The ceiling was 68 feet above the floor and the size of a basketball court. He built a scaffolding and climbed up, insisting on doing the work by himself. He lay on his back to work. His body ached and paint dripped on his face, but he persisted until the work was completed. It was an arduous task. He began in 1508 and finished it in 1512. Years later he returned to the Sistine Chapel to paint a huge fresco behind the altar. He called it the Last Judgment. When the pope looked at the finished painting he was embarrassed. 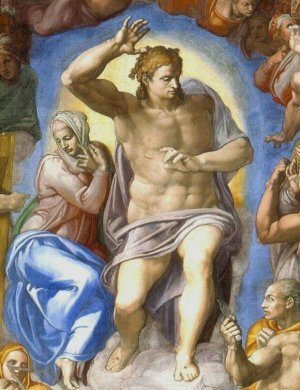 Michelangelo had painted all the people without clothing! The pope hired another painter to paint clothing to cover the figures. Michelangelo was furious. When the Medici returned to power, he spent nearly twenty years working for them designing their tombs and the Medici Chapel. 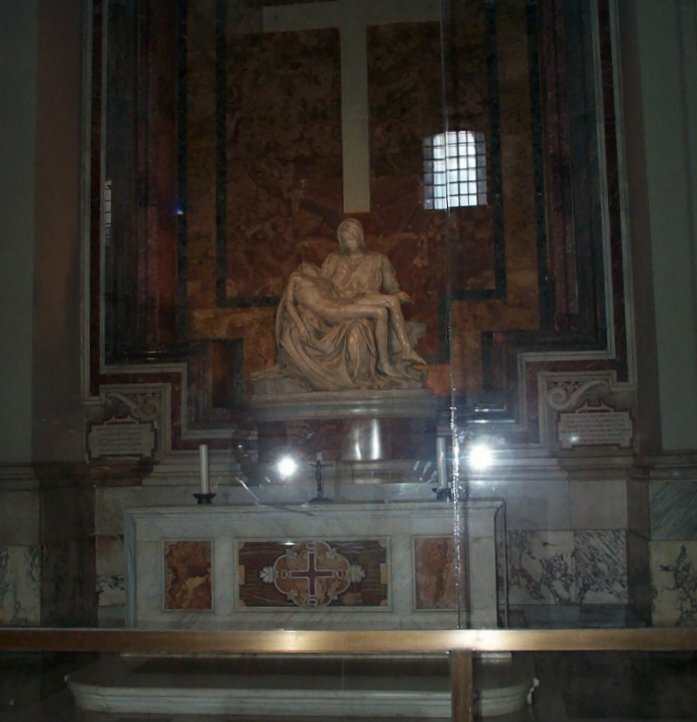 Julius II also wanted Michelangelo to carve statues for his tomb. He originally wanted 40 marble statues, but only three were completed. The next ten years were spent in Rome working for Pope Paul III. It was during this time he painted The Last Judgment and started the construction of the dome in St. Peter's Church. 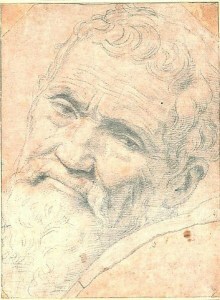 Michelangelo at the end of his productive life was 89 years old. Barter, James. Artists of the Renaissance, San Diego: Lucent Books, 1946. 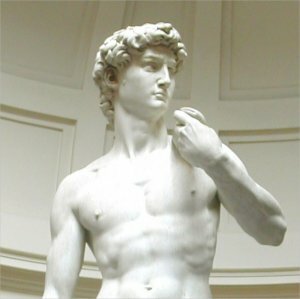 At biography.com search for Michelangelo. 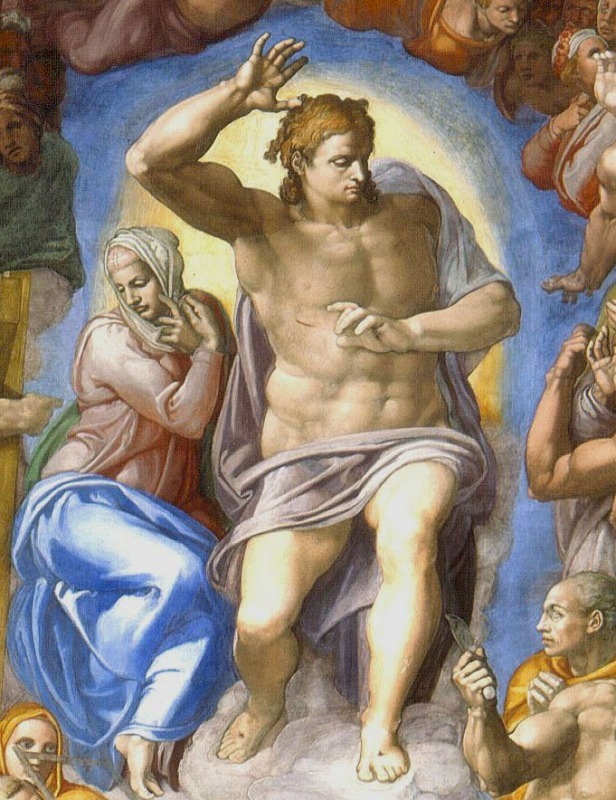 Press "Go" to search for books about Michelangelo. Thank you for a great website my daughter loves learning here. I have shared with many friends, also started using the Bible Study with my daughter. Thank you again, for providing a safe fun place for our kids to learn. I am doing a project on Rome, and your website provided those interesting details that no one else had. Thanks!! Thank you so much for sharing this information with us - your website is spectacular! THIS IS A COOL WEBSITE! This page displayed 504,227 times.